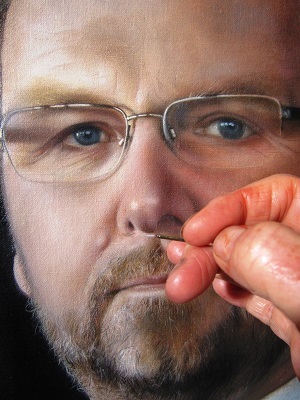 The art of portraiture is one of the most classic art forms within oil painting which has existed for centuries. In the ancient times the artist moved in with the model for months while the painting was under construction. Beside the practicality of moving in with the model the close and personal connection between them is important to make a strong portrait. The model personality is under the surface and has to be brought out on to the canvas. Ginny Page uses photo sessions and traditional sittings in the process. Hereby Ginny Page ensures capturing the models personality. Depending on the portraits composition, sessions will normally be in the studio of Ginny Page. The model attending one of several sittings. Details is added at the sitting. The video (link below) is produced by "Dansk Metal"(Metal workers Union in Denmark) - 2 minutes. (In Danish with English Subtitles). 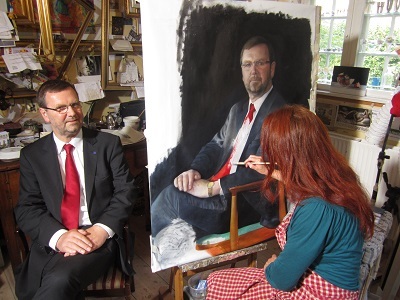 In the video Ginny Page explains the process creating the portrait of chairman Thorkild E. Jensen. Please follow link below for other portraits on this site. Please feel free contacting Ginny Page for inquires regarding potential portrait commission(s).